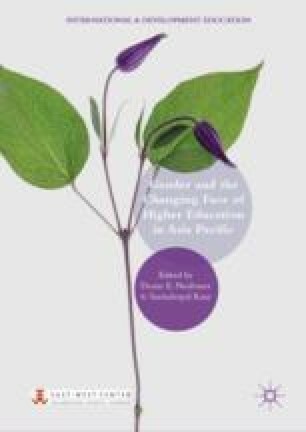 This chapter sketches out the inequities in higher education based on gender and more specifically the asymmetrical gendering of experiences and outcomes of students and faculty in higher education institutions in the Asia-Pacific region. Many of the gender issues are related to access, retention and completion and career progression; field of study, horizontal segregation by discipline and impact on academic career and postgraduation earnings; and the everyday experiences of students and faculty. The Asia-Pacific region is large and culturally diverse, comprising higher education systems at different levels of development. Thus, the manifestation of gendered inequity in different systems also varies significantly. The chapter reviews various policy interventions as advocated by international organizations. It also examines new concepts such as “gender fairness” and “gender borders” within higher education. Association of American Colleges and Universities. 2014. Peer Review. Special Issue, Gender Issues in STEM. https://www.aacu.org/peerreview/2014/spring. Accessed July 3, 2016. LeeAn, J. 2009. “Civil Society: New Feminist Network for ‘Glocal’ Activism”. Inter Press Service, April 20. http://www.ipsnews.net/2009/04/civil-society-new-feminist-network-for-39glocal39-activism/. Ma, Wanhua. 2010. Equity and Access to Tertiary Education. World Bank. Available at: http://siteresources.worldbank.org/EDUCATION/Resources/278200-1099079877269/547664-1099079956815/547670-1276537814548/China_Equity_Study.pdf. Ng, Soo Boon Ng. 2016. Sharing Malaysian Experience in Participation of Girls in Stem Education. UNESCO, International Bureau of Education. Available at: http://www.ibe.unesco.org/sites/default/files/resources/ipr3-boon-ng-stemgirlmalaysia_eng.pdf. UNESCO. 2015. “A Complex Formula: Girls and Women in Science, Technology, Engineering and Mathematics in Asia.” UNESCO and Korean Women’s Development Institute. Available at: http://unesdoc.unesco.org/images/0023/002315/231519e.pdf.